Devenir tracks health savings accounts in the credit union industry closely through NCUA filings and variety of other sources. Below are some key points from our Q2-2017 analysis. $1.54 billion – Total HSA assets held at credit unions totaled $1.54 billion as of 6/30/17, up 15.8% year-over-year. 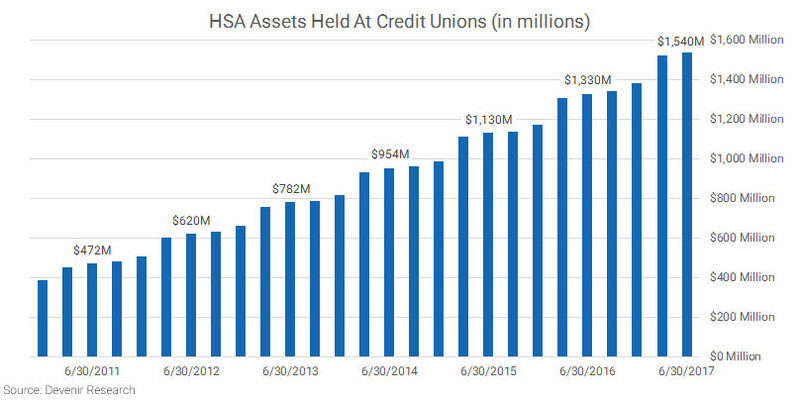 842 – There were 842 credit unions holding HSA assets as of 6/30/17 (14% of credit unions), up from 832 credit unions at the end of 2016. There are 32 credit unions that each held at least $10 million in HSA assets as of 6/30/17. 51% – The 25 largest HSA asset holders among credit unions hold 51% of all HSA assets at credit unions. 3.6% – Credit unions hold about 3.6% of all HSA assets. Questions about this research or have some feedback for us? Let us know!